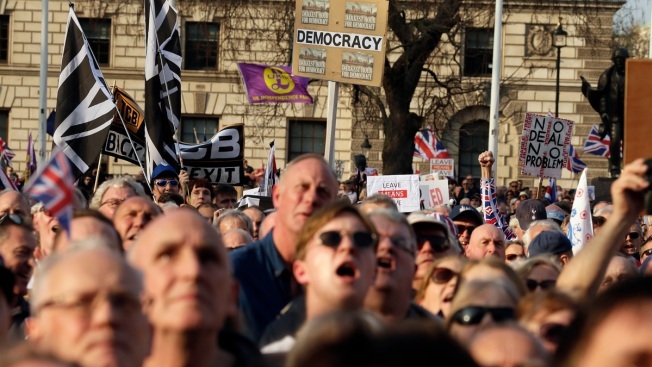 Pro-Brexit leave the European Union supporters attend a rally in Parliament Square after the final leg of the "March to Leave" in London, Friday, March 29, 2019. 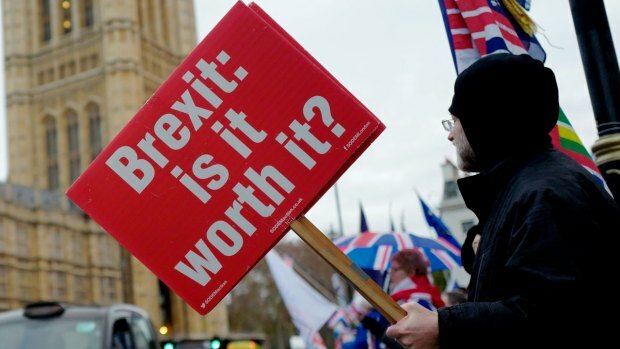 The protest march which started on March 16 in Sunderland, north-east England, finishes on Friday, March 29 in Parliament Square, London, on what was the original date for Brexit to happen before the recent extension. The U.K. may be forced to create a national unity government to end the impasse over Britain leaving the European Union, as Prime Minister Theresa May clings to the Brexit divorce agreement that Parliament has rejected three times, a senior Conservative suggested Saturday. Former Education Secretary Nicky Morgan's comments came a day after the House of Commons rebuffed the prime minister's call for lawmakers to "put aside self and party," sending her Brexit deal to its latest defeat. The rejection leaves the U.K. facing the stark prospect of a chaotic departure from the EU in just two weeks — unless squabbling politicians can put aside their differences and engineer a long delay in the process of leaving the bloc. The British Parliament will vote Monday on a variety of Brexit alternatives in an attempt to find an idea that can command a majority. But May's government is considering a fourth vote on her deal, bolstered by their success in narrowing her margin of defeat to 58 votes Friday from 230 votes in January. "If the government refused and Theresa May felt she could not implement what Parliament had identified as a way of leaving the EU, then I think we would have to think very hard about whether a cross-party coalition ... could do that in order to make sure that the U.K. does leave the EU in an orderly fashion," Morgan told the BBC. 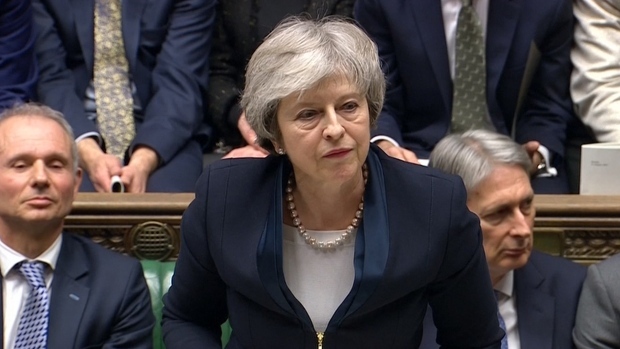 British lawmakers rejected a Brexit deal put forth by British Prime Minister Theresa May by a record margin on Jan. 15, with 432 MPs voting against her deal at the House of Commons. Britain has in the past had national unity governments in times of national crisis, such as World War II. But critics point out that such coalitions were forged when there was a single goal — such as defeating Nazi Germany. It is unclear now how Britain's political parties would agree to cooperate on an issue like Brexit, which has split the country and its two major political parties, May's ruling Conservatives and the opposition Labour Party. As a result of Friday's vote, the U.K. is now scheduled to leave the EU on April 12, regardless of whether the two sides have reached an agreement to cushion the impact. That has led to concerns about crippling tariffs, border gridlock and shortages of food and medicines. EU officials have suggested, however, they may agree to a lengthy delay to Britain's departure from the bloc if U.K. politicians agree on a plan. The House of Commons on Wednesday began the process of debating alternatives to the prime minister's deal but rejected all eight proposals they considered. Two ideas, a customs union with the EU and a second referendum on any deal, achieved significant support. Lawmakers are expected to hold a second round of votes Monday on Brexit proposals. Hilary Benn, a Labour Party lawmaker who chairs Parliament's Brexit committee, dismissed criticism that the parliamentary process was a failure because it didn't deliver a majority in the first round of voting. Benn said he hopes the latest defeat for May's deal will "concentrate minds" and help build a clear majority for one of the Brexit options. "Since it took 2 3/4 years for the government to get what it had negotiated defeated three times, it's a little bit harsh on Parliament, when it started the process last Wednesday, for not having immediately solved the problem in 24 hours," Benn said. "So I think a little bit more time is a perfectly reasonable thing to provide as we try and find a way forward." British Prime Minister Theresa May announced she has postponed a key parliamentary vote on Britain’s Brexit deal with the E.U. While Benn and Morgan are pushing for compromise, others are demanding that the Conservative-led government not cave in. Some hard-line Conservative Party lawmakers have written to May insisting that she not agree to a Brexit extension beyond May 22, which would force the U.K. to take part in the May 23-26 European Parliament elections, The Sun newspaper reported. The letter, signed by 170 members of the prime minister's party, called on May to bring her deal back to Parliament for a fourth vote, with the threat of a general election if it is rejected again, the newspaper said. Brandon Lewis, a Cabinet member and chairman of the Conservative Party, said he was aware of the letter, though he had not seen the final text or the signatures. "We should be doing everything we can to leave the European Union in good order as quickly as we can, as we said in our manifesto and as we've said to Parliament," Lewis said. "I think the deal is the right way to do that."